There's nothing better than reviewing a product that exceeds all expectations from start to finish. The brand-spanking new Nikon D700 DSLR is one that does. It may cost £2,000, but this camera is worth every single penny, and more. The first indication that the D700 is destined for greatness was that it shares many features and components with Nikon's flagship DSLR, the D3. And along with the more expensive D3, the D700 is possibly the only camera we've tested with which we would feel confident shooting at ISO 1600+. In raw mode, images shot at up to ISO 6400 can be cleaned up very easily, making these ultra-high settings genuinely usable. 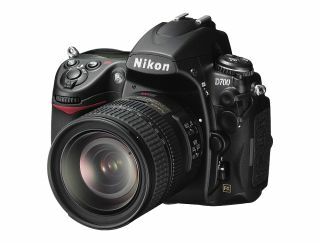 The rock-solid build quality, and its large, bright viewfinder make the Nikon D700 a pleasure to use. It also turns out excellent images at ISO settings that would make other cameras blush. If we were in the mood to nitpick we would complain that 12 million pixels is starting to look a little bit limited, when the 14 million pixel Pentax K20D can be picked up for around a quarter of the cost of a D700. But really, the D700 is the ultimate enthusiast's DSLR, offering class-leading performance across the board. If you've got the money, buy one immediately!